When I tell people that I live in Pinner, I usually have to explain that it's near Wembley and Harrow, places they will probably have heard of. Originally a small village that can be traced back to Saxon times, it is now a suburb of London whilst still retaining the feeling of a close knit community. 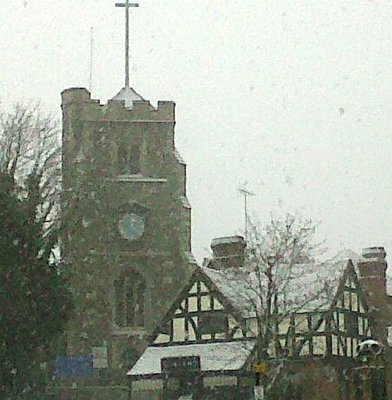 The origin of the name is 'Pinna's settlement on the side of the hill', and Pinner is mentioned for the first time in 1231 when a dispute was brought before the king's court. It was also the largest village in Harrow manor and by 1240 was home to its own wooden chapel, which was rebuilt in stone in 1321. In 1336 King Edward III granted Pinner a weekly market and an annual fair. The latter still takes place on the Wednesday after the late Spring Bank Holiday at the end of May, when the fairground rides are set up on either side of the old High Street, spilling out along Bridge Street and Marsh Road. The village grew gradually over the following centuries, but saw its greatest growth with the advent of the Metropolitan Railway and the opening in 1885 of a station, from where you could reach Baker Street by steam train within thirty minutes. By this time the local population numbered about 2,350; now the residents of Pinner are more than 19,000. Modern day Pinner continues to be a popular place to live, although it is now part of suburban Metroland. Despite the loss of most of its old, big houses, many of which were demolished around the middle of the twentieth century, the village, particularly the old High Street still retains strong links to its past. Many of Pinner's older buildings, some dating back as far as the fifteenth century, still remain, some with listed building status, although they are now outnumbered by houses and blocks of flats built throughout the twentieth century. Although the old High Street still retains much of its period charm, the shops are now twenty-first century business, such as clothes' shops and cafés, betraying their Tudor and Georgian origins where customers could buy meat, groceries, metal and wooden goods, or have their horses shod. However there are still two remaining public houses. 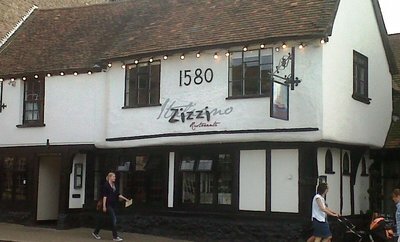 The Queen's Head was originally built in 1633 and The Victory (now a pizza restaurant) was constructed in 1480, although the sign on its exterior proclaims 1580. A typical English village should comprise at least one pub and a church; the church remains but the High Street is now only home to one pub. People visit Pinner to eat in the various restaurants and cafés or browse the shops. However the community lays on various events throughout the year. In addition to the annual funfair, there is a village show in Pinner Memorial Park each September and a series of brass band concerts in the same park on every Sunday in August. These are usually very well attended, regardless of the weather. Many of the locals pack a picnic for the afternoon, or visit Daisy's in the Park, the café/bistro in West House, which is also home to the Heath Robinson Museum. (William Heath Robinson lived in Pinner about 100 years ago and is best remembered as a humorist and cartoonist.) There is also an annual celebration for St George's Day in the High Street every year, part of which is the eccentric 'Wheelbarrow Race'. This is when pairs of people race wheelbarrows (one pushes and the other is the passenger) through the village, stopping for a drink at each pub in Pinner on the way. The parish church houses the summer music festival every June, and also lends it beautiful acoustics to various jazz concerts throughout the year, as well as an annual candlelit concert of chamber music every December. Currently Pinner Sketch Club is running its annual summer exhibition in the church hall: not exactly the Royal Academy, but definitely worth visiting for picking up inexpensive and original paintings. Come and visit Pinner because it's a mixture of old and new and you may even find yourself wanting to move here. The milestone at the top of Bridge Street (by the Oddfellows' Arms pub) records that we are 13 miles from London. If you don't want to come by wheelbarrow, the Metropolitan line will suffice.